Official temple record for deceased individuals, 1991-, Salt Lake City: Filmed by the Genealogical Society of Utah, (1991-) , Refer to Film Number: 1760755. "New Hampshire, Death Records, 1654-1947," index and images, FamilySearch (https://familysearch.org/pal:/MM9.1.1/FSLZ-LQT : accessed 05 Dec 2012), Emma Tirrell, 16 Nov 1864. 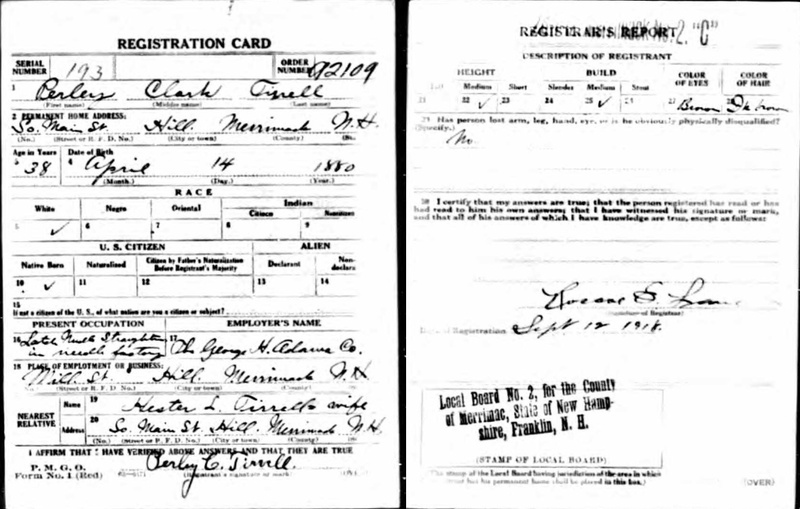 Consolidated Lists of Civil War Draft Registrations, 1863-1865, Washington D.C.: NM-65, entry 172, 620 volumes. ARC ID: 4213514. Records of the Provost Marshal General?s Bureau (Civil War), Record Group 110. National Archives, , National Archives and Records Administration (NARA); Washington, D.C.; Consolidated Lists of Civil War Draft Registration Records (Provost Marshal General's Bureau; Consolidated Enrollment Lists, 1863-1865); Record Group: 110, Records of the Provost Marshal General's Bureau (Civil War); Collection Name: Consolidated Enrollment Lists, 1863-1865 (Civil War Union Draft Records); ARC Identifier: 4213514; Archive Volume Number: 1 of 2. 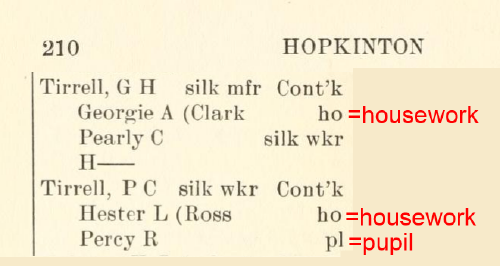 "New Hampshire, Death Records, 1654-1947," index and images, FamilySearch (https://familysearch.org/pal:/MM9.1.1/FSJ1-FJ7 : accessed 15 Dec 2012), Henry J. Tirrell, 14 Jul 1902.
living at Crosby Lynchburg Rd, Crosby, Harris County, Texas. 1930 United States. Bureau of the Census. 15th census, United States, 1930 federal census : population schedules ; NARA microfilm publication T626, Washington, District of Columbia: Bureau of the Census Micro-Film Laboratory, ([19--?]) , Census Place: Precinct 3, Harris, Texas; Roll: 2352; Page: 26A; Enumeration District: 177; Image: 888.0; FHL microfilm: 2342086. 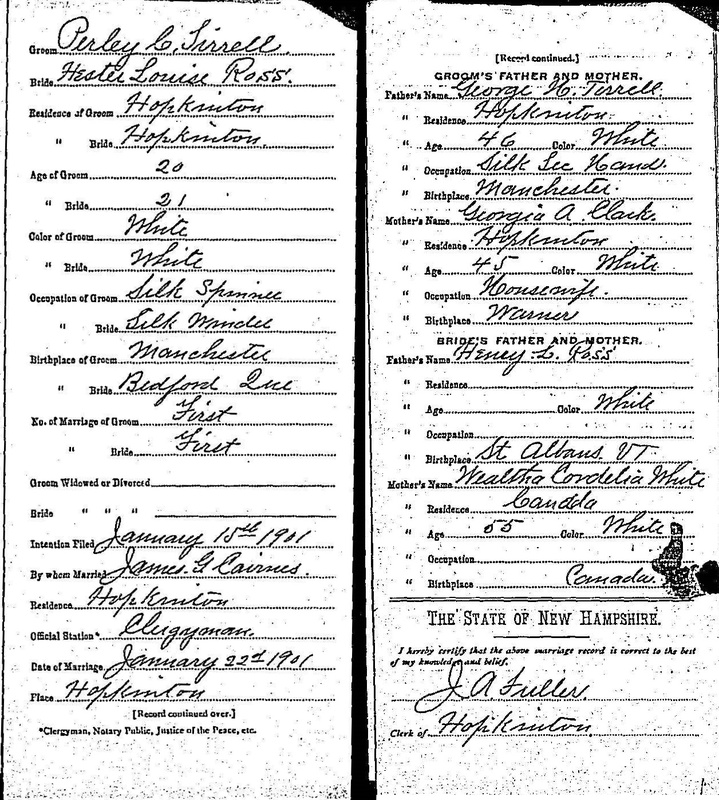 "New Hampshire, Birth Records, Early to 1900," index and images, FamilySearch (https://familysearch.org/pal:/MM9.1.1/FLPX-J5J : accessed 27 Nov 2012), Kirby Tirrell, 19 Aug 1899. Social Security Death Index, at http://www.ancestry.com/ssdi/advanced.htm, 451-24-7172. "United States Census, 1930," database with images, FamilySearch (https://familysearch.org/ark:/61903/1:1:XQGP-BJH : accessed 20 December 2016), Frank M Wyman, Belmont, Middlesex, Massachusetts, United States; citing enumeration district (ED) ED 181, sheet 22B, line 83, family 529, NARA microfilm publication T626 (Washington D.C.: National Archives and Records Administration, 2002), roll 914; FHL microfilm 2,340,649. "New Hampshire, Death Records, 1654-1947," index and images, FamilySearch (https://familysearch.org/pal:/MM9.1.1/FSLZ-LZ8 : accessed 30 Nov 2012), Minnie Gertrude Tirrell, 17 Oct 1867. 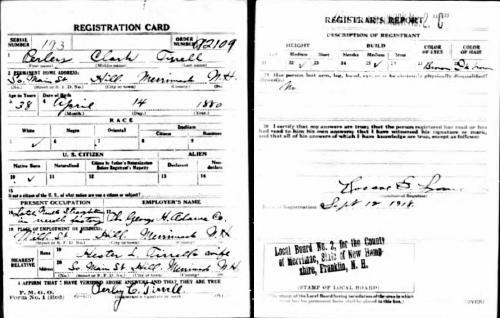 "New Hampshire Birth Certificates, 1901-1915", database with images, FamilySearch (https://familysearch.org/ark:/61903/1:1:Q2SD-ZX64 : 18 April 2016), Percey Reginald Tirrell, 1902. "New Hampshire, Deaths and Burials, 1784-1949," index, FamilySearch (https://familysearch.org/pal:/MM9.1.1/FDK8-BS6 : accessed 26 Apr 2014), Perley Clark Tirrell, 17 Jun 1940; citing Bedford, Missisquoi, Canada; FHL microfilm 2297209. Robert Wilson Tirrell, The Tirrell, Tirrill-Terrill, Tyrrell book: descendants of William Therrill, (1969) , p. 295. Cook County Clerk, Cook County Clerk Genealogy Records, Chicago, IL: Cook County Clerk?s Office, (2008) , File Number: 2949. 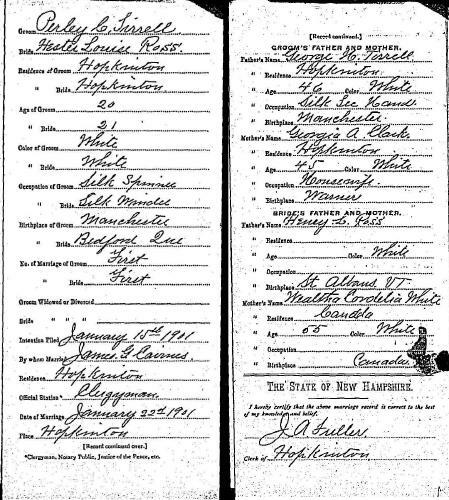 "New Hampshire, Birth Records, Early to 1900," index and images, FamilySearch (https://familysearch.org/pal:/MM9.1.1/FLPX-JB8 : accessed 27 Nov 2012), Willard Harold Tirrell, 06 May 1894.